The US, along with the rest of the ‘post-industrial’ world, faces complex issues: manufacturing jobs lost, real wages down, dependence on fossil fuels and imported goods. Instead of making ‘sweeping statements’, Trump could sweep up waste to make new products, and grow remanufacturing (already worth US $45 billion each year). The circular economy can help the US – and your business – thrive. Trump’s campaign included bold promises: to re-shore manufacturing, create 25 million new jobs, and double economic growth. CNN notes ‘Trump’s plan calls for lowering taxes, removing ‘destructive’ regulations, increasing U.S. energy production, and negotiating new trade deals in favour of American businesses,’ and talk of imposing import tariffs as high as 35%. High living standards and levels of ‘consumption’ in the US create challenges, with consumer electronics, clothing and machinery helping the US become China’s largest export market. Trump talks about ‘turning around’ the $350bn US trade deficit with China. US companies reduce labour costs by outsourcing (‘offshoring’) manufacture to China, and more US jobs have disappeared as technology and automation improves labour productivity. Resource security is a concern: whilst the US mines a range of metals and minerals, it imports many critical materials, depending on China (especially for Rare Earth Elements, essential for many technology applications) and other countries including Russia and Canada. remember that ‘waste=food’: extracting valuable elements from end-of-life and process waste to create new by-products, and recover process inputs such as energy and water. It makes sense to keep materials circulating: keeping the product itself in use, or recovering materials to remake into new products. Dumping waste in landfill, or exporting it for reprocessing, means re-importing all the valuable resources you discarded. Circularity in consumer categories could yield ~US $700 billion materials savings worldwide, every year. DIY repairs to extend the lives of consumer durables and technology products are gaining momentum, helped by ‘open-source’ websites such as iFixit, and supported by big brands like Patagonia. The iFixit ‘global repair community’ provide manuals, diagrams and publish scores comparing the ‘repairability’ of smartphones and tablets, including the difficulty of opening the device, whether special tools are needed, and how easy it is to replace major components. Remanufacturing, restoring an end-of-life product to like-new condition, is well-established in the US. Over 6600 companies supported 180,000 full time jobs in 2011, increasing exports by 50% in 2 years across aerospace, consumer products, and many industrial and technology applications. Trump could leverage the experience of companies like Caterpillar to accelerate remanufacturing. 3D Printing, or Additive Manufacturing, reduces material input and waste. Companies like GE are investing heavily, seeing potential for 3D printed components to replace complex sub-assemblies with multiple parts, reducing weight and improving structural integrity. 3D Printed spare parts keep machinery and technology equipment going for longer. The US could deploy 3D Printing to enable distributed (local) manufacturing. There’s gold in them thar hills waste mountains! Americans dispose of 2 kilogrammes of waste, per person, each day. US companies have promised to use more recycled materials, but are struggling to secure supplies. The Economist reports that ‘low landfill fees and a fragmented waste-management system have kept the country’s recycling rate at around 34% for two decades—far lower than most rich countries.’ America can recycle high-quality materials to use in new products, rather than ‘downcycling’ into lower-grade plastics, aggregates, fillers etc. Are these circular economy levers enough to grow the economy? Moving away from ‘low-cost sources’, or imposing heavy import tariffs, would increase prices and put pressure on household budgets. The current budget deficit will make it difficult to cut taxes and invest in welfare and infrastructure. And why stick with GDP as the headline measurement of success? Perhaps Trump can adopt a more populist measure, like Gross National Happiness used in Bhutan, and tax use of virgin materials, instead of wages. Businesses worldwide, of all shapes and sizes, are re-thinking their strategies and delivering new value. 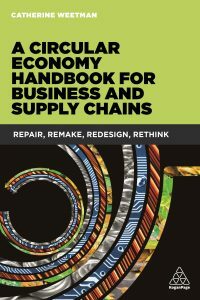 My new book, A Circular Economy Handbook for Business and Supply Chains, shows how organisations across all market sectors are using the circular economy to develop new products, expand markets and future-proof their business models.